Developing an employee wellness program can be an effective way to reduce health insurance premium costs and produce a much happier, and healthier workforce. All of these factors add up to greater levels of productivity that can generate additional business revenues. Many business leaders don’t know how to start a corporate wellness program that gets results. Here, you will find 8 steps to take towards creating an employee wellness program for your workforce. The best designed corporate wellness benefits and programs focus on the actual needs of employees. How can you get this detailed information? Conduct a workplace survey and ask employees directly. Get at least 5 to 10 low-cost wellness ideas out there for wellness perks and see what are the most popular that your employees choose. As part of your survey, you will also be assessing the lifestyle concerns and wellness needs that employees have. For some, it could be getting more active; for others, it could be to reach targeted health goals. Get to the heart of these needs to increase participation in the wellness program. To facilitate your corporate wellness program, it’s time to research and find a technology product that can help employees self-manage their wellness goals. There are many wellness tech tools that can help employees keep their health in check, track fitness, and weight loss goals, and connect with the resources they need to make informed choices. 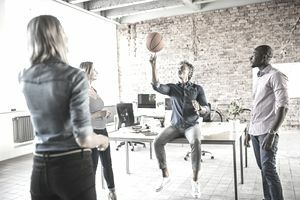 A successful wellness program is made up of many people and resources, including the support of the employee benefits company and wellness vendors. Be sure to work directly with the insurance broker to find out what wellness benefits and tools already exist, because many offer free and low-cost options now. Connect and establish a directory of local wellness vendors to provide services like onsite massage therapy, healthy cooking demos, and even discounted wellness gear. Just like any other employee policy you create, you will also want to publish clear employee wellness program guidelines and make them part of your employee handbook. Hand them out when recruiting and when enrolling employees in their benefit plans, and have posters around the workplace that educate employees about this wellness initiative. One way that many companies roll out their wellness programs is with an onsite health and wellness fair for employees and their families. Work with local vendors to participate, and include a wide variety of wellness interests to make this a successful event. Time the wellness event around certain dates. Schedule one at least two months before the annual open enrollment period. While your wellness fair will be a fun event, it’s no substitute for year-round education and promotion of your wellness program. Make it a part of your corporate culture with ongoing incentives for employees to take steps to better their health. Host walking and running clubs, have an area on campus for fitness and de-stressing and create marketing around the idea of wellness at work. Over time, your company will be able to spot trends in the way employees respond to and participate in wellness programs. Success stories will emerge out of the ranks of those who take part in the wellness offerings. Make sure to gather feedback and ideas for future enhancements to the program.